Learn Why Paratrex Is Defense Against Harmful Organisms! What are the health benefits of Paratrex? Why is Paratrex the best product for harmful organism cleansing? What are the top 3 questions people ask about Paratrex? What are customers saying about Paratrex? Paratrex is a comprehensive blend of all-natural ingredients formulated to promote the cleansing and detoxification of harmful organisms. Harmful organisms are everywhere and can be transmitted by people, pets, the environment, food, and water. They steal your nutrients and release toxic waste into your body. When you've been infiltrated and become a dumping ground for these critters, your health can suffer. Paratrex can help cleanse your body of these unwanted invaders. Imagine if you opened the doors and windows to your home and let the wildlife enter and live, unchecked. How long would it take before a state of disaster would be declared? The inside of your body is the same way, harmful organisms release waste and weaken your immune system. Harmful organisms are just like any other living organism -- they need nutrition to survive. When they've taken up residence in your body, that nutrition comes from you. Harmful organisms feed off your food and steal your nutrients. Contaminated food, water, air... nobody is immune to exposure from harmful organisms. In fact, you may be affected right now and not even know it. Indications can vary from none, to mild discomfort, to serious disease. If you experience abdominal discomfort, digestive issues or constipation, nausea, malaise, weakness, loose stools, or weight fluctuations it could be a big sign you're being affected by harmful organisms. 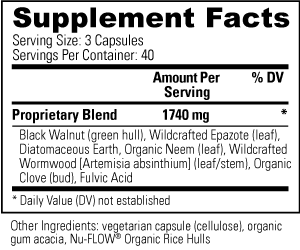 You can buy a cheaper "harmful organism cleansing" supplement but you can't buy a better one. Do you really want to waste your money on a product made with low-quality herbs that have an unknown or questionable origin? Pesticide laced "herbs" from China are a real problem you don't have to worry about with Global Healing Center products. Choose Paratrex and avoid the frustration of dealing with ineffective, junk supplements. Colon cleansing, liver cleansing, and chemical and toxic metal cleansing are all plans that offer incredible benefits, especially when performed semi-regularly and in succession. Harmful organism cleansing with Paratrex is your next piece of the puzzle. Turns your body into an environment that is hostile to harmful organisms. Ridding your body of harmful organisms frees the nutrients they've been stealing. Cleansing your body of harmful organisms can rejuvenate your energy levels! Formulated by a doctor and a team of leading natural health specialists! We are sure you will see and feel the health benefits of Paratrex. Only Paratrex contains organic and wildcrafted ingredients that are tried and tested. Paratrex works by creating an environment within your body that is not welcoming to harmful organisms. Paratrex is an ultra absorbable, highly bioavailable formula produced with the highest quality herbs available. Paratrex does NOT contain artificial ingredients, fillers, or dangerous ingredients. Easy capsules, no bad tasting concoctions! 1. How does my body become infested with harmful organisms? Harmful organism exposure is often attributed to environmental factors and may include undercooked meat, fish or poultry, contaminated water, poor hygiene, contact with feces or soil, pets, and unwashed fruits and vegetables. 2. Why is Paratrex effective? Paratrex is made from a proprietary blend of premium herbs of the highest quality to support natural detoxification by creating an environment within your body that is not welcoming to harmful organisms. 3. Is Paratrex a total cleanse? Paratrex is effective but for the complete harmful organism cleanse protocol, please view the instructions for the harmful organism cleanse kit. Keep your body in an alkaline state, avoid acidic foods like sugar, dairy, wheat, meat, fish, and poultry. Thoroughly wash all raw organic fruits and vegetables and drink plenty of purified water. Water from streams or lakes may be high risk. When camping, boil your water to kill harmful organisms. Cook meat according to guidelines to kill harmful organisms and their eggs. Use a quality probiotic supplement to promote healthy probiotic colonies in your digestive tract. Use Oregatrex™ for additional support against harmful organisms. Get Started Today and Cleanse Your Body With Paratrex! Rich in ascaridole, epazote is an herb of choice for attacking and expelling various harmful organisms that take up residence in the intestinal tract. Keep out of reach of children. Do not take if pregnant or nursing. Consult your healthcare provider for any additional concerns. Store tightly closed in a cool, dry place. For the complete harmful organism cleanse, please view the instructions for the Harmful Organism Cleanse Kit. How common are harmful organisms? How long should I use Paratrex? Should I take Oxy-Powder® while taking Paratrex? What diet should I follow while taking Paratrex? Can I give Paratrex to my children? Can I give Paratrex to my pet? Harmful organisms are everywhere. They can enter the body through undercooked meat, contaminated water, poor hygiene, unwashed fruits and vegetables, pets, even walking around barefoot. Whether they know it or not, it's estimated 90% of the population has some form of harmful organism lurking in their bodies! Stealing nutrients and releasing waste into your body, the health consequences of harmful organism infestation can be severe. If you suffer from any of the following, you should consider cleansing your body of harmful organisms. Paratrex is a comprehensive blend of all-natural, wildcrafted herbs traditionally used and appreciated for harmful organism cleansing. It kicks the harmful organisms out of your system by establishing an internal physical environment that is hostile and unwelcoming. Because the life cycle of many harmful organisms is six weeks, cleansing with Paratrex for a full six-week cycle is recommended. Should I take Oxy-Powder while taking Paratrex? Although it's not a requirement, supplementing with a maintenance serving of Oxy-Powder 2-3 times per week can help the body purge harmful organisms as they die, as well as the toxins they release. While cleansing with Paratrex, we recommend following the body cleansing diet. If you miss a serving, take it with your next meal and continue as directed. Paratrex hasn't been tested for children but we've received reports of encouraging experiences. We suggest speaking with your natural health advisor to determine the needs of your child. Paratrex hasn't been tested for pets but we've received reports from customers who've had encouraging experiences. We suggest speaking with your veterinarian to determine the needs of your pet.